What Is The Coastal Portuguese Camino De Santiago Like? The Coastal Portuguese Camino de Santiago route was developed by pilgrims who arrived on Portuguese shores by boat from western lands then made their way north on foot. Although the word ‘coastal’ suggests that you’d be sending a lot of time by the ocean, most of this route is actually inland. Not sure what the Camino de Santiago is? Read this first. Note: If you want to spend several days walking along the beautiful Costa Verde of northern Portugal, there is another option which might suit you better. Click to find out more about this alternative coastal walking holiday. This map shows the main stage breaks on the Coastal Portuguese Camino de Santiago. The section between Caminha and Oia is more coastal than it appears on this map and is one of the most attractive stages. Which stages of the Coastal Portuguese Camino are by the ocean? If you start your Camino in Porto and really want to be by the water, you have the option of spending your first day walking the unofficial but easy-to-follow route alongside the beach between Matosinhos and Vila do Conde. Towards the end of the following day, the route heads inland and unless you take a detour or two, you won’t see much of the sea until you get to Galicia. 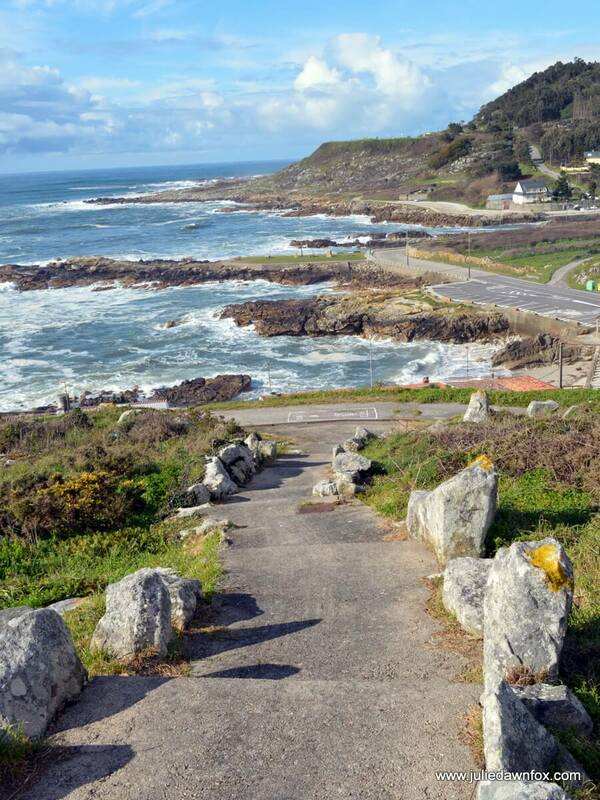 The first two days in Galicia between A Guarda and Baiona involve some beautiful and exposed coastal stretches. After Baiona, you’ll see the Vigo lagoon from a distance but won’t spend any more time by the ocean. How busy is the Coastal Way? The Coastal Route is less well-known and therefore quieter than the Central Route so you may not see many other people while you’re walking. I spent one entire day (in May, one of the most popular months) walking alone without spotting a single fellow pilgrim after leaving the hotel. That level of solitude may or may not appeal to you but it’s something to bear in mind. One of the endearing aspects of walking the Camino, and possibly a reason people become addicted to it, is the joy of meeting fellow walkers, their support and encouragement and the friendships you make along the Way. The Coastal Portuguese Camino de Santiago merges with the Central Way in the town of Redondela. At this point, you should expect to encounter many more pilgrims each day. They are still easy to avoid if you don’t want company. What is there to see on the Coastal Camino? The coastal Portuguese towns/cities of Vila do Conde, Viana do Castelo and Caminha are particularly attractive and have a long, rich history. They are all worth exploring if you have the energy or can build in rest days. Over in Galicia, A Guarda and Baiona are charming seaside towns with sights and streets to explore and delicious seafood. The built-up city of Vigo has few historical or particularly noteworthy sights worth making a detour for but if you have time for a rest day, you could take a boat to the pristine beaches of the Cies islands. 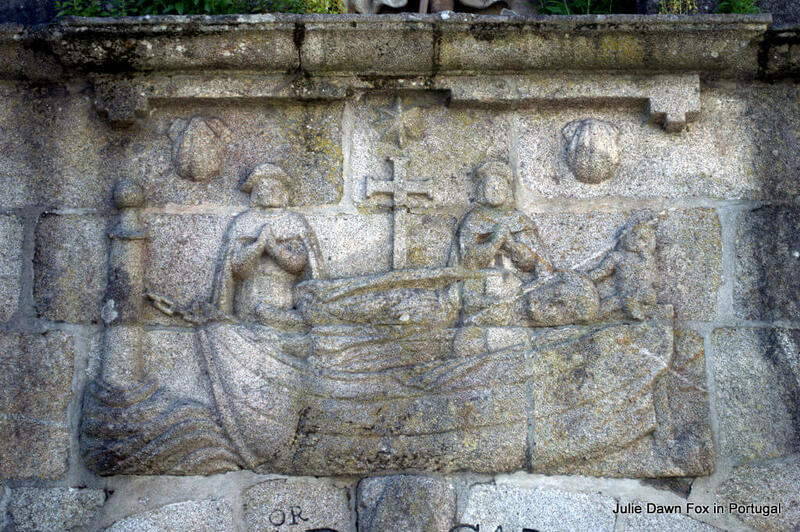 The most attractive places after merging with the Central Way in Redondela are the waterfront at Arcade, the historical city of Pontevedra, the small spa town on Caldas de Reis and Padrón, the place where the boat carrying St. James’ body is said to have landed. Want to know more about the Coastal Way of St. James? Next Post: What Is The Central Portuguese Camino De Santiago Like? I am hoping to do the Camino from Baiona to Santiago, or even further if I have the time. I am female and will be making the trek solo. Should I be concerned? Is safety an issue? Hi Leah, Unless you are extremely unlucky, or willfully put yourself in harm’s way, you should be absolutely fine in terms of safety as a solo female. I’ve done some of that stretch on my own without issue. Depending on the time of year, there may not be many fellow ‘pilgrims’ on the route until you reach Redondela but after that, the Coastal way merges with the Central route so there will be more people to provide support if needed. Locals are also used to seeing people on the Camino and will help if you are in trouble. You might find that having the added security of a 24-hour emergency support number is a comfort – you’d get that if you make the arrangements for hotels and luggage transfers through a specialist tour operator. We are heading to Portugal June 2019 with our bikes. Is the Camino bike friendly? Or is it only pedestrians? We are thinking of Porto to Vila do Conde and back to Porto. Hi Ramona, I’m afraid I can’t say – I wasn’t thinking about bikes when I did it. There are cycle paths along the coast but other than that, I can’t help. I have done this walk starting from A Guardia…I did it at the beginning of June and, as you mentioned, did not encounter Pilgrims for many days until I reached Pontevedra. Loved the coastal walk. Will do it again but this time starting from Porto.